This ultra-gentle bi-phase make-up remover is enriched with a narcissus extract and moisturising rose floral water, skin-softening orange blossom and decongesting cornflower floral water. Also containing castor oil and a protective prebiotic, this eye make-up remover helps strengthen eyelashes and protect the fragile skin around the eyes, while gently removing even water-resistant make-up. Test conducted on 26 women during 4 weeks. Dermatologically and ophthalmologically tested. AQUA/WATER - CENTAUREA CYANUS FLOWER WATER, - SQUALANE – GLYCERIN,,, - DECYL GLUCOSIDE - ROSA DAMASCENA FLOWER WATER, - CITRUS AURANTIUM AMARA (BITTER ORANGE) FLOWER WATER, - RICINUS COMMUNIS (CASTOR) SEED OIL, - NARCISSUS TAZETTA BULB EXTRACT, - ALPHA-GLUCAN OLIGOSACCHARIDE - DEHYDROACETIC ACID - SODIUM CHLORIDE - SODIUM BENZOATE - BENZYL ALCOHOL. Removes eye make-up easily, gently and effectively. Doesn't contain any nasties. No real scent for a floral product. This is an oily product but it doesn't leave a residue or irritate the eyes. It removes eye make-up easily and has a good go at Benefit They're Real mascara - a tough test. It is fairly good value for money. The bottle has lasted a long time as you don't need much. The oily consistency means it does not drag the delicate skin when applying. I definitely prefer this to removers that contain nasties, it loses nothing through this. Firstly i loved the packaging,it was expensive and fresh looking and i feel looked appealing and fits the brand and natural ingredients well. The eye makeup remover was very easy to use and after giving it a little shake i dispensed just the right amount onto a cotton pad. After placing over my eye and leaving there for a few seconds i gently wiped away to notice that it effectively and effortlessly removed most of my makeup. It is perfect for the delicate eye area and took very little effort but most of all was not greasy or leave a film on the eye. I was looking forward to trialing this product from Melvita. 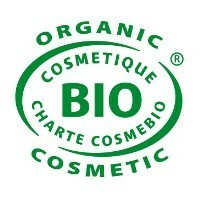 I use another branded Oil-free eye makeup cleanser which is very effective and gentle. So I was looking to compare. I was hoping that this one, with all its natural extracts and no chemicals would make it stand out against others on the market. Unfortunately for me it didn't. The mixing of this twin level solution was easy and when applied to a cotton pad it was light, albeit quite watery which caused it to soak through, so you have to be careful on how much you actually pour out. The cleanser was gentle at removing eye-makeup even waterproof mascara, which I use at all times. YOu can almost do the two eyes with one cotton pad, reversing the sides. You only have to let the pad sit on the eyelid/lashes for a few seconds to allow it to melt into the makeup/mascara and the swipe it off, a couple of actions are required to clear all, but no panda eyes left. Unfortunately I didn't get quite a clear/clean feeling after use, when I opened my eyes I felt a blurriness, which meant that solution possible seaps and remains at the eyelash root. I didn't like this result and had to use a very mild spritzer toner on a cotton pad to remove this remaining residue, which felt oily/greasy to touch. The product does state Oil-free, but I think this, is that it has less oil so anyone with Oily producing skin would be able to use. I'm afraid it does have an oil that sits on the skin, which is unpleasant. Understandable the oil is needed to 'melt' mascara but I think I will stick to my usual purchase which is half the price, more ml's and no residue. 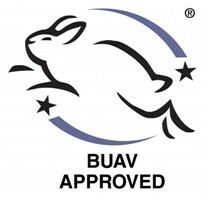 Almost without fragrance, non-greasy, effective, organic ingredients, fair traded, natural ingredients, not tested on animals. Very slightly aggravating to sensitive eyes. This product comes in an attractive bottle which is not too large to be used as a travel item. The product itself has two components which require blending by shaking the bottle. The layered effect of the product gives quite an attractive effect. The fluid is easily dispensed though a small insert in the neck of the bottle which prevents over usage of the product. On eye make up the fluid easily dissolves mascara without the need to rub extensively and leaves the eye area well cleansed. Although named 'floral' the fluid has an almost imperceptible fragrance. However I did notice a slight warmth and irritation in the eye area, caused by the application of the product, but this did not last long. 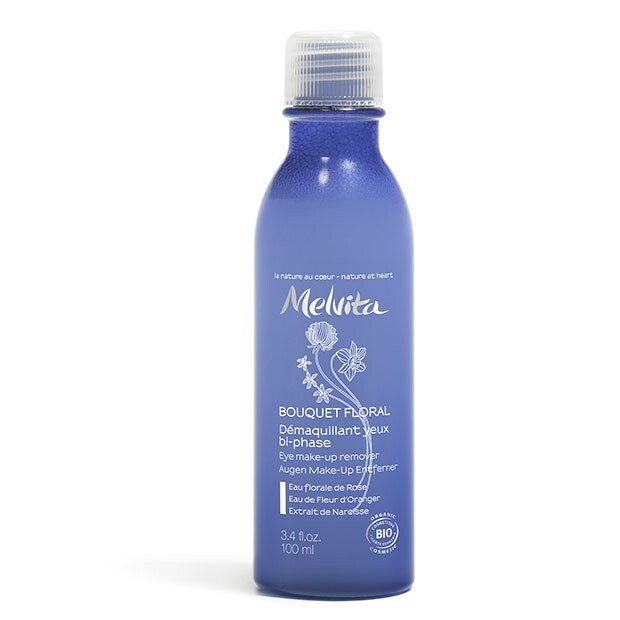 I am a big fan of the original eye makeup remover by Melvita and was very intrigued to try the new version. Being a bi-phase formula I had high expectations of this product. As always I love the 100% recyclable bottle however, I did feel that the packaging of this new eye makeup remover was fairly unremarkable in comparison to its predecessor. The ingredients are a very clever mixture; each in its own right addresses several common issues of the delicate eye area. Rose floral water is wonderfully hydrating and the skin-softening orange blossom helps dry areas. The cornflower floral water was a huge plus for me. I have used products in the past with this ingredient and I have found it to be one of the most effective ingredients for cooling, soothing and decongesting as I suffer regularly with swollen puffy eyes. It is a two phase product that needs to be agitated by shaking the bottle before use. The bottle is an easy hold slim shape and has a small hole stopper in the neck to prevent over dispensing of your product with a small screw top lid. The bottle is opaque blue in colour, conducive to the product inside. There is a mild scent which is very subtle and fresh. As with the previous product you only need a small amount of fluid applied to cotton pads and the fluid itself is completely colourless. As with all eye makeup products I place the cotton pads over my eyes for a few seconds. If it is a good quality remover this should melt your makeup minimising the amount of rubbing on the delicate eye area. There are certainly no complaints with the efficiency of this product. I very quickly and easily removes my eye make-up without rubbing however I did find that I have to conduct a few more wipes than Melvita’s previous product to ensure that all makeup was totally removed. The products gives an instant cooling and soothing sensation to the eye area and does not strip or dry out the skin. Many have reported an apparent greasy residue. This is present however it disappears very quickly and acts as a wonderful moisturiser without being heavy. My eye contour skin is very sensitive and is susceptible to puffiness from oily or greasy products but I am very impressed with this product that actually has the opposite effect by reducing puffiness. As I like to experiment with my products I have decanted some of this into a smaller bottle which I keep in the fridge. I have used it as an eye compress and the effects it has on puffiness and irritation are fantastic! I recommend you try this method. You only need a small amount of product per cleanse so this makes the bottle excellent value for such a quality eye makeup remover. All in all I have really enjoyed this product. My honest opinion is that I prefer the original eye makeup remover as I found it completely effortless for removal of makeup; however, I am very keen to keep a bottle of this product to hand as it cannot be beaten on its effectiveness on puffiness, irritation and sensitivity. This will become one of my prescription products for when my eyes suffer flare-ups of sensitivity. If you have not had the pleasure of experiencing Melvita products before I would strongly recommend that you at least try this one. It by far exceeds the performance of some other leading brand eye-makeup removers and with the added benefit of its organic ingredients it is worth every penny of its price tag! A high performance product which far exceeds the performance of some other leading brand eye-makeup removers and with the added benefit of its organic ingredients it is worth every penny of its price tag!